The Datatable is the core structure of the powerful Google Visualization API. As its name suggests, a Datatable can be used to generate HTML data tables, through a google.visualization.Table object, but it can also be used to generate graphics (along with Google Charts). Unfortunately, by default, a google.visualization.Table cannot automatically display grand totals, lines or columns, so I will show you how to do that with a bit of script. Read the complete source code here. Although it is rather easy to get the vertical total (by applying an aggregation google.visualization.data.sum), the horizontal total is more tricky to obtain (you must create x aggregation columns, filter, and add the line). Also note that we had to hack a bit the Total column sort. The last row must be excluded from sorting, indeed, otherwise you’ll see the grand total move up one time in two: hence the listener on the ‘sort’ event, which maintains the grand total at the bottom of the table. As a final present, here are two bar charts, easily obtained from our previously built Datatable, thanks to the Google Charts API. data.removeColumn(data.getNumberOfColumns()-1);		// We must remove the Total column! To generate the second chart (where columns and rows have swapped), we just need to build an inverted Datatable of data by pivoting. The code of this permutation can be found in the full source code of the example. Reminder: INSERT INTO VALUES ... WHERE ... does not exist in MySQL. Lately, I had to work on a buggy application: all the annotations @Transactional, defined at the business level, seemed to be ineffective, in spite of the correct definition of a transactional manager in the main Spring context of the application. So I expected the file myapplication-servlet.xml (= Spring MVC context) to define the controllers of the application. Instead of just scanning the MVC controllers (in foo.myapplication.controllers), we scanned the whole application! Therefore, the business beans were scanned a second time (note that this is not a problem for Spring). But, like many other things in the Spring framework, the declarative support for transactions relies on AOP proxies, and AOP proxies are only valid in the Spring context where they are defined in. As a consequence, the declaration <tx:annotation-driven />, in the main Spring context, was ineffective in the MVC context. Business beans and DAO beans are now defined in the main context, i.e. where the JPA manager is also defined. The MVC Spring context should only contain the components of the MVC framework, and no business- or data-access-logic. Not respecting this principle is not only a mistake from an architectural perspective, it is prone to erros that may stay hidden long. By combining OpenOffice and the library JODConverter, it is easy to add an Office-to-HTML (or -PDF) document conversion service to a J2EE/Spring application. 3. In ConvertorJod, it is important to modify the path leading to your OpenOffice install, as well as the path of the template profile to use. Now that your webapp has correctly started, your document service bean is available to your other beans. As the startup of OpenOffice occurs only once (when the application context mounts), conversion times are rather good (about one or two seconds for an average size file). Note that if you don’t specify explicitly a template folder, a default one will be used instead, and if that one does not exist, the daemon process soffice.bin will not start. This is particularly important in the case of a webapp, as it is unlikely that your application server runs under an account for which an Office template folder exists. DocumentFormat outputFormat = converter.getFormatRegistry().getFormatByExtension("html");    // "html" ou "pdf"
Since Spring WS version 2.0, it is straightforward to get a MessageContext object from within the endpoints, and therefore to retrieve/return attachments from/in SOAP messages. But with the previous release (1.5.9), the one I still have to use at work, it is not that simple. So I started from an idea given by another Java blogger, explained here, which consists in intercepting the SOAP request, and saving the MessageContext in a ThreadLocal. In his post, the author of that trick shows how to extract an attachment sent by the client to the web service. I am going to show you the opposite way: how to add an attachment in the web service response. In the method execute() of a Tasklet, if you want to store data in the ExecutionContext of the current Step, be careful. if you try to modify what it returns. Inheritance does not exist in the entity-relationship model as such. A variant of the latter strategy also exists (table per class), but I ignore it for simplicity (it consists in defining one table per concrete class, gathering the attributes of the concrete class as well as those of all the superclasses). Hibernate supports both techniques, and can even mix them. It is that mixing inheritance strategy that I am going to talk to you now. I have taken my inspiration from this article, a bioinformatics paper that proposes an ontology of clinical terms associated with neoplasms. I will not dwell on ontologies, nor on tumors ; I am just taking the classification scheme provided by the author as an example. Let’s assume now that these classes have some attributes and methods (not listed). Let’s also assume that the top class (Neoplasm) and the middle classes (NeuralCrest, GermCell, Mesoderm, Trophectoderm, Neuroectoderm and EndodermEctoderm) are abstract. And the other ones are concrete. Now imagine that we want to persist instances of concrete classes in a relational database. And first, how are we going to map this object model to a physical database model? Contrarily, the bottom-level classes will probably have specific very attributes. Creating one big single table “neoplasm” including all attributes of all classes, along with an additional field to discriminate the class name, is not very elegant… even if that solution is probably a winner in terms of performance (no table joins needed). I am saying “probably” because it depends on how the database will handle a large number of columns with NULL values. Moreover, indexing a column of that big table means indexing all the recordings of that table… including, potentially, unnecessary ones. Creating one table per concrete class, with as many foreign keys as there are inheritance relationships, is a classic solution… But with 26 classes, we need 26 tables. Moreover, if bottom classes have few attributes of their own, is it really necessary to create dedicated tables only for them? Couldn’t we limit the number of tables by combining some tables, locally? That’s where mixing inheritance strategies comes in handy. 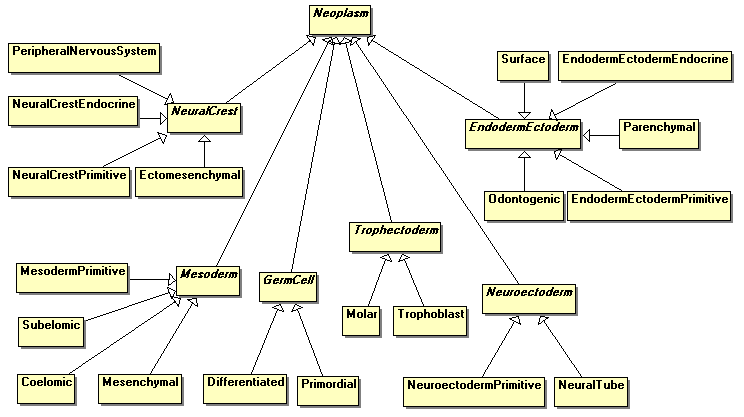 For example, classes Molar and Tropoblast will be grouped in the table Tropectoderm, classes NeuroectodermPrimitive and NeuralTube in the table Neuroectoderm, etc. Field type is the type discriminator of the class hierarchy (we need one, since we have merged some classes). By default, Hibernate automatically populates this field with the simple name of the Java classes. Third level classes use both the secondary table AND the global table (Neoplasm). Note that JPA annotations are not automatically inherited, and therefore must explicitly be set in all the subclasses. That’s why my code makes use of a public constant TABLE_NAME, in order to define in one single place the name of the mapped table. Care should be taken to create a referential integrity constraint on the primary key of each table towards the primary key of Neoplasm (ie Trophectoderm.id -> Neoplasm.id, NeuralCrest.id -> Neoplasm.id, etc..). This will prevent deleting from a secondary table without deleting the associated row in Neoplasm. We mapped our object model to a database model containing 7 tables, instead of 26 tables with the usual joined strategy. A read operation in a bottom table requires only one table join, a write operation two inserts (or updates). 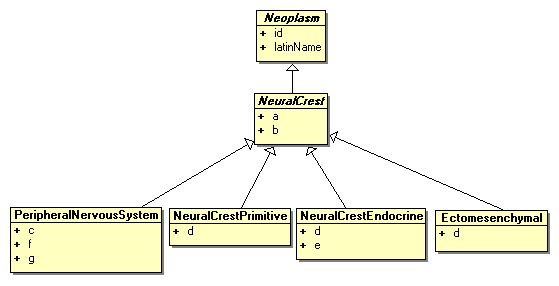 Rather than letting Hibernate save textually the class name in the discriminator column, we could define an entity NeoplasmType(id, name), and set a foreign key in Neoplasm for this entity. We then must not forget to define the corresponding numerical identifier in every concrete class, with the annotation @DiscriminatorValue. Spring Test, JUnit and EasyMock are a good team for unit testing. Unfortunately, classes that inject their properties by autowiring can be difficult to test when these properties have to be mocked (DAO for example). Why? Because Spring determines the type of a factory-method-defined bean by reflection. So if the method returns an Object or a parameterized type, just like EasyMock.createMock() does, autowiring by type will not work (even if you specify the bean’s name with @Qualifier). But you may not want to use that annotation, or make an explicit reference to the name of a bean. Unfortunately, you will have to write as many methods as there are objects to mock, which might be tedious. If you are not satisfied with any of these two solutions, there is a last possibilty: defining an unmocked version of your class (so that autowiring can work), and then relying on the interface BeanFactoryPostProcessor to replace this unmocked bean, in Spring’s registry, by a mocked version. – a class MocksFactoryPostProcessor which will receive a list of beans names to redefine. Note that this solution requires that you make use of classextension.EasyMock (to mock by concrete class, and not by interface). Castor is a lightweight and efficient Java / XML data binding tool. One of the first pitfalls you can fall into is conversion date. Castor provides a mechanism to customize serialize / deserialize fields via a handler class. The most practical solution I’ve experienced is to extend the class GeneralizedFieldHandler, as in the example below. Note how the deliberately erroneous date in the third <version> of the list has been handled, and how we get a null instead, as expected. The advantage of extending GeneralizedFieldHandler, as we do, is that DateHandler can be reused for other date fields. However, if different date formats were expected, we would have to implement ConfigurableFieldHandler. On 14 November 2008, I defended my degree work in computer science at the CNAM high school of Paris, thus completing five years of studies taken in addition to my job. My studies at the CNAM are marked by diversity. They began with a first set of courses called “Driving System” (systems architecture, system programming (C under Linux), software engineering, distributed applications, networks). My major was database engineering: relationnal/multimedia/spatial databases, indexing, documents searching, as well as the XML standards. I also wrote a report about metaheuristics (which are particular iterative techniques to optimize combinatorial problems). My final report focused on my work at the Institut Curie for 18 months, where I developed a distributed software to integrate biomedical, statistical and genomic data. These courses at the CNAM, added to my initial training as an analyst-programmer (see my CV) allow me to deal with many problems arising in IT.